NORFOLK (NNS) -- Commander, Submarine Force Atlantic and Commander, Submarine Force, U.S. Pacific Fleet, in conjunction with Commander, U.S. Strategic Command, commemorated the Submarine Force's 4,000th strategic deterrent patrol, Sept. 19, by conducting dual ceremonies in Bangor, Washington and Kings Bay, Georgia. The first fleet ballistic-missile submarine USS George Washington (SSBN 598) was commissioned Dec. 30, 1959, and completed the inaugural deterrent patrol in January 1961. Since then, 59 SSBNs have been commissioned in the last 50-plus years. Having patrolled the waters worldwide, the ship has established itself as the most survivable, critical, and efficient element of our U.S. national security and the security of U.S. allies and partners. "The ballistic missile Submarine Force and the capability it offers is as important and relevant in today's uncertain world as it was when the first deterrent patrols were conducted more than five decades ago," said Adm. Cecil D. Haney, Commander, U.S. Strategic Command. "Commemorating the 4,000th patrol allows us to honor not only the submariners who have achieved this milestone, but also to pay homage to the men and women of our strategic forces who are on watch every day providing our nation with a safe, secure and effective nuclear deterrent against those who might think to do us harm." 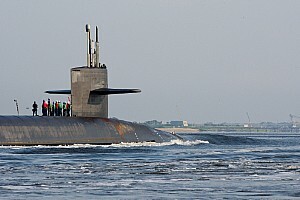 Along with strategic bombers and the intercontinental ballistic missiles, the SSBNs make up the third element of the United States' triad of nuclear deterrence. SSBNs are critical, stabilizing and efficient elements of U.S. nuclear deterrence and reassurance, and with their sea-based missile launch capability makes them the most survivable asset. They carry the majority of deployed U.S. nuclear warheads allowing them to stabilize deterrent relationships and render surprise attacks inconceivable. "Today, we celebrate a very special milestone in the undersea warfare community as we commemorate the 4,000th strategic deterrent patrol conducted by our fleet ballistic missile submarines," said Vice Adm. Michael Connor, commander, Submarine Forces. "Strategic deterrence has been the sole mission of the fleet ballistic missile submarine since its inception. As the sea-based leg of U.S. strategic deterrent forces, the current 14 Trident SSBNs carry more than 50 percent of the total U.S. strategic warheads. Today's concept of strategic deterrence seeks to deter attacks on the U.S. or its allies, dissuade adversaries from actions counter to stability, and peace, and to assure allies of the United States' commitment to their security." The current fleet of Ohio-class SSBNs has already been life-extended and cannot be extended any further. They must be replaced by new class of SSBNs to meet the our future strategic commitments. "The Sailors have done their part to ensure peace and the ships have done their part too as they now start to serve well beyond their original design service life," said Connor. "Now the country must do the same to continue to ensure the peace for our children and our children's children. We must build Ohio's replacement. There is no more important or more effective use of our national defense spending than to ensure that we build the 12 ships that will enable exceptional Sailors like you to guarantee the peace for future generations." Vice Adm. Joseph Aucoin, deputy chief of Naval Operations for Warfare Systems, echoed Connor's concerns about the Ohio replacements. "We as a nation are also demonstrating credibility through commitment to our deterrence strategy, the sustainment of the Ohio class and the procurement of the Ohio replacement. We must procure and maintain a force of Ohio replacement SSBNs, in order to keep them properly postured and positioned to be survivable and to ensure adequate target coverage." While the material and mission readiness of the strategic deterrent fleet is primary focus areas, these elements would be mute without the personnel readiness of our Sailors. The professional and personal development needs of our Sailors and their families are critical aspects in recruiting and retaining our best and brightest to ensure mission accomplishment in the Submarine Force. "The submarine is perhaps the most technological marvel ever! As we continue to build and develop new submarines they are becoming even more advanced - quieter, stealthier, going deeper, and armed with highly superior weapons systems," said Vice Adm. Terry Benedict, director, Strategic Systems Programs. "However, this is all for naught if not for the men and now women of the silent service. Equally - if not more important than the payload or the platform is the Sailor. Our Sailors have and will continue to protect and provide credible deterrence to those who would otherwise wish us harm." "It is my great honor to congratulate Commander, Submarine Forces and all the Sailors, civilians, and veterans of the Submarine Force who have dedicated themselves to achieving this significant milestone - our nation's 4,000th Strategic Deterrent Patrol. This milestone demonstrates not only the far-reaching importance of strategic deterrence to the security of the United States and its allies, but also the significant role the U.S. Navy plays in maintaining this posture. "History shows us that it is difficult to predict the future of conflict. But it also shows us that we must always be prepared for the threat of conflict. So, I thank you, for protecting peace, promoting global security, and for all you do to ensure the safety of our Nation."